Control line Navy Carrier is another form of flying I have always wanted to try but never had the chance (yes, I know, no excuses). 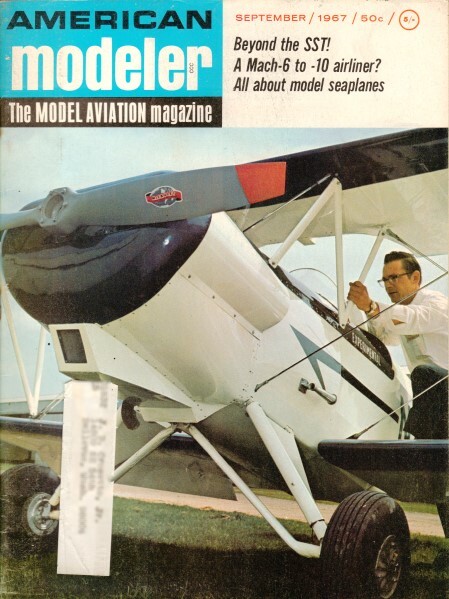 Here in this 1967 edition of American Modeler is a photo of the guys at the Livingston, N.J., Model Airplane Club assembling their fancy new carrier deck. There are not a whole lot of videos out there of control line Navy carrier flying, but I posted a couple good ones I found. Take one small but enthusiastic model airplane club, one big dream, lots of wood, paint, nails, hard work, Coke and hamburgers and you come up with the Livingston, N.J., Model Airplane Club, and Essex County's newest carrier deck. 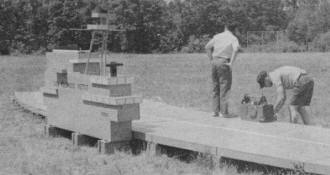 Early in 1966 the club decided to enter the carrier event competition by constructing a carrier deck at G.V. Controls Co., Livingston, N.J. The carrier deck, complete with a scale island, was carefully blueprinted by senior club members. U.S. Plywood Company's 3/4-in. 4x8 AC fir panels and etitt Paint Company's epoxy and marine paint were the materials chosen by the club to withstand the rigors of weather resulting from a permanent outdoor installation. The Club's 18 or so junior and senior members pitched in, laying out panels, cutting wood, nailing and painting. The island is removable during flight competition and also serves as a storage area for sandbags, hardware and lines. By June the carrier deck was completed and ready for the first carrier takeoff.